The Homematic IP Starter Set Light offers everything that is necessary for easily getting started with the Homematic IP smart home system. 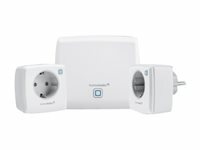 The set consists of the Homematic IP Access Point and two Homematic IP Pluggable Dimmers.The Homematic IP Access Point connects the Homematic IP cloud located in Germany to the linked Homematic IP products in the home using encrypted communication. Therefore, the Homematic IP components can be used locally in the own four walls as well as via smartphone while being away from home. As no personal data is collected during installation, users remain anonymous even though the system is based on a cloud solution.The Homematic IP Pluggable Dimmers are plugged into existing sockets and thus enable switching and dimming of connected lamps. Via the Homematic IP app or wall-mount remote controls/remote controls, light sources can be dimmed almost infinitely in 0.5 percent steps.